Crane was founded on the belief that design is an attitude and the home is a personal expression of an individuals lifestyle. Our products are functional, efficient and communicate an appreciation for good design. Crane's unique sense of design, an unwavering commitment to quality, and always remaining a step ahead of the crowd, allows us to continue to create our own distinctive interpretation of small home appliance design. •Designed for rooms up to 500 sq. ft.
Crane set's themselves apart from the rest with cool designs that are both functional and fun. 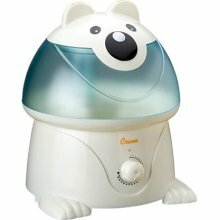 The Adorable Animal line of cool mist humidifier's is just that; ADORABLE. Adding humidity back to the room, that air conditioner's and heating unit's dry out is essential for comfort and health. We placed our Crane Adorable Animal Cool Mist Humidifier (pictured above) in the Playroom where the air is a little dry due to the air conditioner. It has made the room so much more comfortable! There are so many benefits to Cool Mist Humidifier's and with the kids heading back to school soon the spread of germs and subsequent cold or stuffy nose is inevitable. Adding a cool mist humidifier to the rooms in your home can help alleviate the symptoms of colds, and make the air more comfortable. Crane adds the most creative twist to a functional necessity, we will definitely be adding a few more to the bedrooms in our home! Experience the benefits of Crane's Cool Mist Humidifier! 1 Lucky Reader will Win a Crane Cool Mist Humidifier of their choice! Leave a comment~ Which Crane Cool Mist Humidifier would you love to add to your home? The comment is considered your entry.